Let's just say that morph has a little baggage. Three-mana Gray Ogres really aren't very strong in Limited or Constructed, there are tournament challenges with regards to penalties, and the ability is one of the more complex one that we have put in common in the New World Order era. So, why did we bring it back? Well, the mechanic does something that is very interesting—playing around with hidden information, and adding morph to a set lets us ratchet up that feeling a few notches. Magic has a lot of hidden information as it is, which is something that I believe has done a lot for its success. Unlike a game like chess that has nothing hidden, Magic has libraries and hands that are by default invisible to the opponent. Magic does have a ton of revealed information, though—with the battlefield, graveyard, and exiled zones. The combination of the known-knowns and the known-unknowns is very important for Magic, because it lets each player get closer to knowing what might be in his or her opponent's hand, and what he or she should be playing around. It creates a game that is a lot about guessing, and that is very good for guessing things right. Naturally, this leads players to often wanting more effects that give them information, so they can make better decisions and win more often. Richard Garfield obviously realized this when he created Magic, because he made the card Glasses of Urza to do just that. If a player wants to see what the opponent is doing, he or she can do so for the cost of one card. The problem with this effect is that it isn't very fun. It's okay to do it from time to time, but the more players are able to remove hidden information from the game, the less surprise Magic has to offer, and I think the less fun the game is. Imagine the alternative-reality version of Magic where everything is face up—library included. Would the game be more skill testing? Probably, but it would also be next to impossible to play because of how much data you would need to make each decision. You could never complain about a topdeck just before you were going to win. You would often be able to tell very early in the game who would win, but it you would spend a huge amount of time playing it out just to see if the opponent made a mistake. I don't think that this version of Magic is the darkest timeline version, but it isn't far off. One of the reasons I play Magic, and I think it is the same for many of you, is that I like the mystery that happens with each game—using my wits to try and figure out what could be in my opponent's hand, on the top of his or her library, or even what I could be drawing next. Taking that away leads to games that come down to raw computational power for the cards in play and in the libraries, and removes a lot of the power that intuition or reading people and situations bring to the game. Two of our mistakes in Theros block were Thoughtseize and Courser of Kruphix, and not just because of the cards' power level. Both cards are very powerful, but also reveal a ton of information. It wasn't uncommon for both players to know every card in his or her opponent's hand by the end of turn three and for the game to then play out face up. I don't think we will be shying away from powerful discard in the future, but I don't expect us to print powerful cards like Courser of Kruphix that reveal a lot of information about the top of the library very often. One of the frustrations for many of the members of Magic R&D in watching Pro Tour Journey into Nyx was that the most exciting part of each turn was seeing what card a player would reveal to be drawing NEXT turn. It was a pretty stark contrast when compared to Pro Tour Avacyn Restored, where the miracle mechanic created a lot of memorable topdeck situations and just general excitement for the big thing that would happen that turn. Now, I don't think we want miracles in every set, or in fact very often. Or maybe ever again. But, they did highlight a part of Magic that does excite people—the topdeck. It excites people because of the seeming randomness of it. We want variance in the game, but we don't want the game to constantly come down to it. We want enough variance that it's possible for two players playing almost any two decks to be unsure of exactly how the match will turn out, but not so much that everything is a coin flip. It's my belief that most games should include some amount of variance—I just think that is a lot more fun than games that don't include any. The ways this variance is implemented can change wildly between different games, and I don't think all of those are created equally. I know that Richard Garfield has used the analogy of a chess variant where at the end of each game, you roll a d6, and on a 6 the result of the game is reversed. For sure, there is enough randomness in that variant that the weaker player will win 1/6th of the time, but it isn't handled in a very satisfying way. You win the chess game and then see if the RNG has it in for you or not. A huge part of Magic's variance is handled by the hidden information of what is in a player's deck, because that is where we've found the most fun lays. We could take the variant of Magic showcased above—where you know all of the information in each player's deck, but make a lot of the cards generate random outcomes—and come up with a version of Magic that has just as much variance as our current version. But would that really be more fun? 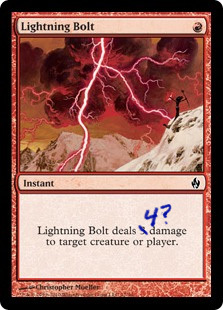 To know that the only difference between winning or lose is whether your Lightning Bolt does 3 or 4 damage? The advantage of the variance coming from hidden information is that it allows for a lot of interaction between players. How many times have you been playing an aggro deck against a control deck and needed to make a decision on whether your opponent has a wrath or not? If your opponent is casting one on turn five, he or she will have seen around thirteen cards by then, meaning there is a pretty good chance your opponent has one. And after the first one, how do you take your next turn? The odds that your opponent has one wrath is pretty high, but a lot lower than he or she having two. In some sense, it is random whether your opponent has drawn zero, one, or two. As the aggro player, you not only have ways of feeling out if your opponent has drawn any, but also of using your opponent's lack of information of your hand to your benefit—say, by hiding the fact that you have drawn a card that will save your team from the second wrath, or by only putting out one creature in hoping your opponent thinks that you are out of gas. Playing this partial information game is only possible because of the amount of hidden information in Magic. 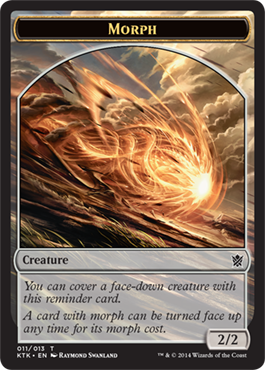 Keeping this mystery alive is one of the major reasons that morph survived the development process—it balances the hidden information aspect of Magic as well as providing an opponent the ability to guess what your card is, to gain an advantage. As I mentioned before, morphs are by themselves incredibly weak as face-down creatures, and our exploration of making them stronger ended up being very unfun. So, instead of trying to force through a lot of morphs with incredibly powerful "turn face up" triggers, we went with the method of making a lot of them strong on the front side, and making the morph cost attractive enough (as well as providing enough of a reason to turn them face down) that the major reason people will be playing them face down is for the mystery. If you look at Onslaught, this was done on both Whipcorder and Blistering Firecat (and to an extent Exalted Angel, although it was the one most designed to be actually turned face up). Putting a lot of the strength on the front side of the creature makes sure that morphs are already being played in decks, which was the first step to getting them played face down. It also helps that we tried to make sure there were enough of these creatures so people wouldn't be sure what the face-down creature was, a problem that Exalted Angel faced. The hope is that when someone playing say, Temur, puts a creature face down, that the opponent will have to guess whether it is the Rattleclaw Mystic, Sagu Mauler, Ashcloud Phoenix, or even Hooded Hydra, and decide which is the correct line based on his or her suspicion of which it is. That's it for this week. Join me next week, when I will be talking about my Commander (2014 Edition) preview, and talking about some changes development is making in how we handle putting tournament cards into Commander products.